by Blas Delgado Ortiz, 15 May 2001, after image at this site. The town was founded in the mid-13th century by Jaroslav and Havel of the Markvartice family on a headland above the Jizera river. Subsequently, the town was owned by the eminent Czech aristocratic families of Vartenberk and Smi�i�t�. Turnov often suffered from incursions from foreign troops. 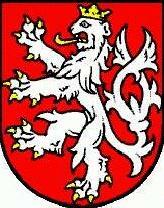 Lusatian Knights of the Cross burned it down in 1468 and Swedes in 1643. A great fire also threatened it in 1707.
focuses on the treatment of stone and metals and the production of jewels. At present, Turnov is the tourist centre of the northern part of the Bohemian Paradise and the ideal starting point for trips throughout the areas of Hrub� Sk�la, Mal� Sk�la and Kloko�sk� sk�ly. The town is also the seat of the administration of the Protected Landscape Area of the Bohemian Paradise. Some interesting fact about Czech municipal Flags - there are also flags with different reverse side there, just like in former USSR. It was in Turnow town, where red field on the backside of flag on City Hall has no picture at all. It has only white and red vertical stripes.